I don’t know if you’ve heard but local fashion label, Ensembles, has just released another designer collection. This time, Ensembles collaborates with the design duo behind the label, Religioso–sisters Yvette Religioso-Ilagan and Choc Religioso-Dayrit. I can’t think of a more perfect fit! Religioso’s designs have always been clean, sophisticated and classy. And with Ensembles being an established name in changing the landscape of ladies’ corporate wear, this collaboration is sure to be a hit! It’s corporate chic at it’s finest! Actually, you can even wear most of the pieces out of the office. I mean look at my Ensembles by Religioso dress! When asked about the collection, Religioso designer Yvette exclaims, “Every piece is stylish, but not faddish!” I would have to agree, as this is always the case when it comes to Religioso’s designs. Their collection for Ensembles is no different. They used a lot of clean lines and straightforward silhouettes while incorporating pleats and color-blocking for impact. Color-blocking, when done right, is always flattering. This dress is the perfect example. There’s also a way to adjust the fit of the dress to your liking. I really love that the back of the black part is not attached/fixed at the back of the dress. You can tighten it through the ribbon. I decided to keep my neckline as simple as possible–simple but striking, just like my dress. 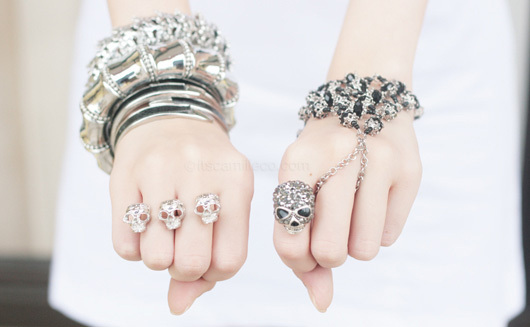 Ring bracelets are so cool! They’re great attention-grabbers which is why I kept this arm bracelet-free. The ring bracelet is enough. Just when you thought I was going for prim and proper, I threw in a few skulls for good measure. Toughened up my look even further with these wedges. Aren’t they pretty? They’re from Malaysian designer, Christy Ng. Her line is now exclusively distributed by STYLO + MYLO here in the Philippines. Check them out on Facebook! Where po tong coexist shop?